Selections from the Estacada Grade School lunch menu included fruit cobbler, pizza, tiger burgers and Easter cake. Among the offerings for adult education classes at Estacada High School were typing, flower arranging, sewing and knitting and auto mechanics. 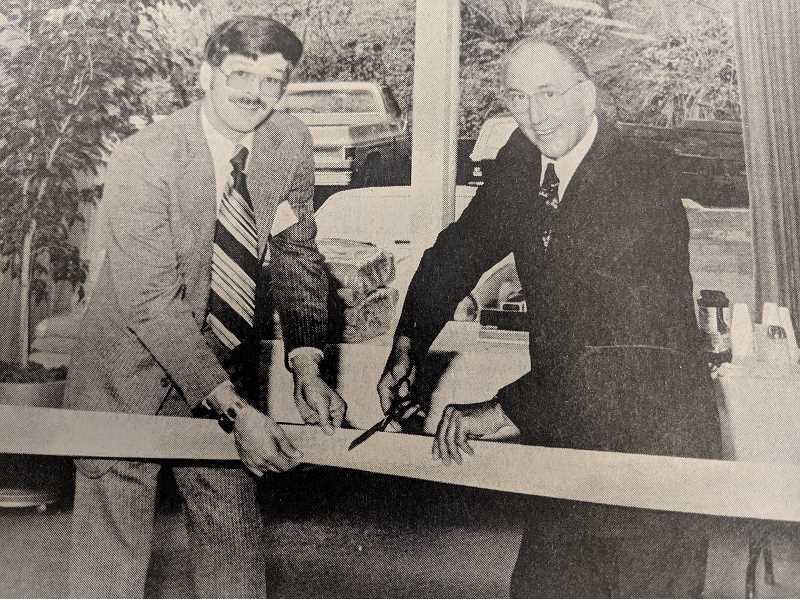 The U.S. National Bank had recently opened a branch in Estacada, one of 180 throughout the state of Oregon. Darrell Nastasi, manager of the new Estacada location, noted that "the local branch should be able to offer a large variety of services and technical expertise." "Count Dracula and his Vampire Bride" was playing at the Broadway Cinema. The film starred Christopher Lee and Peter Cushing. "They're dead but they're alive," an advertisement read. Estacada High School theater students were preparing to stage "Alice in Wonderland." The cast consisted of 25 students and 20 set changes. "The costuming is wonderful, the music is great and the people are sewing like crazy. 'Alice in Wonderland' is a play that adults and kids both like," said theater teacher Karen Luckaupt. Students from Eagle Creek Elementary were preparing to participate in their annual sports challenge. Teams of students were led by teachers at the school, and events included the soccer scatter, crab monster mash, giant steps, jump rope marathon, swamp machine, knee boarding, great flood raft relay and Eagle Creek's eggcellent adventure. n Items from the newspaper's community calendar 20 years ago included bingo at the Harding Grange, a meeting of the Estacada Chamber of Commerce at LB's Restaurant and a variety show at Estacada High School. Local author Stevan Allred was preparing to host the annual Writers Night at the Springwater Grange. Melanie Green would read from her collection of poetry, "Determining Sky," Steve Deniston would read his short short, "Duck Fishing in Darfur," Joanna Rose would read a selection of poetry and Alldred would read his short story, "Conflations of a Hard Headed Yankee." Estacada author Caroline Allen recently published "Fire," the third installment in her "Elemental Journey" series of novels. In "Fire," protagonist Pearl Swinton and her boyfriend backpack across Southeast Asia and eventually settle in London. During the journey, the journalist and travel writer is questioning what her life's purpose is while experiencing mystical visions. Allen's series will consist of novels "Earth," "Air," "Fire," "Water" and "Ether."